I have a legitimate love for Halloween make up kits. I love looking through the tacky sets on store shelves and checking out what's new this year and whats's been repeated. What's cheap and what's expensive (they're usually pretty cheap, but occasionally there's that giant one for $20). 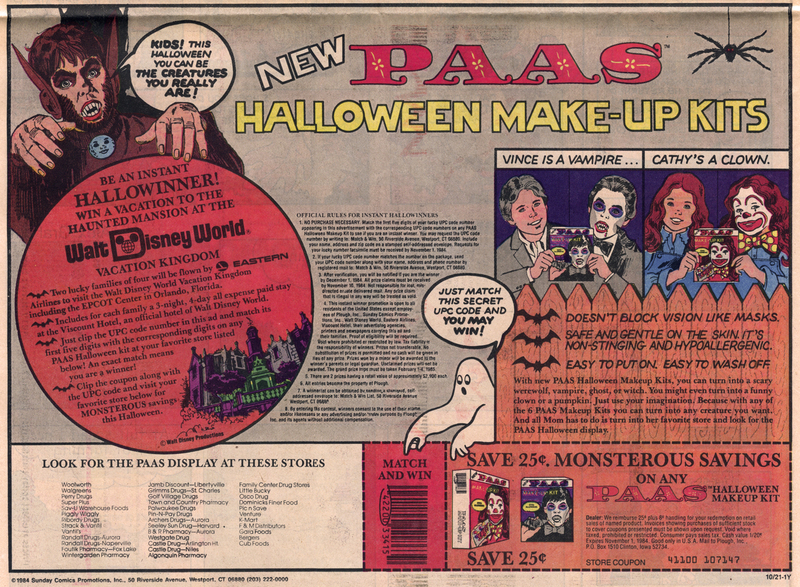 The love came from my annual ogling of the PAAS (the folks who make Easter Egg dye kits) display at the local grocery store or pharmacy every year during my childhood. I loved these kits and was always blown away at how amazing the pictures on the boxes made the finished product look (your results may vary). Usually the back of the box (it was literally the same packaging as the Easter Egg kits) would have cut out accessories to accentuate your costume. Thanks to PAAS, I was the best werewolf ever. The back of the box had cut out wolf ears and a full moon medallion (I had to source some string). Halloween was on a Friday that year, and it was pretty great. We ordered pizza, my cousins came over, and we hit my neighborhood with our pumpkin pails ready for action. After we got home, we watched Teen Wolf and I don't mind bragging that my werewolf costume was so much better than my cousins crappy bed sheet ghost with cheap white face paint. I even got some extra Double Bubble for my efforts, and not because the old lady across the street was giving more to neighborhood kids she recognized... ok, that was probably it. The next day my Mom took us to the mall and I got a Rio Blast Master of the Universe figure. 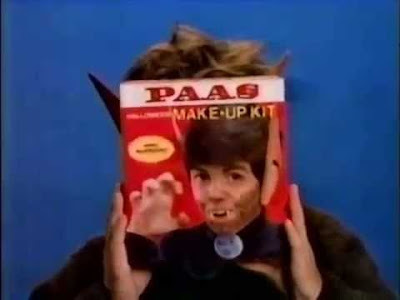 Would it have been such a great Halloween without my PAAS make up kit? 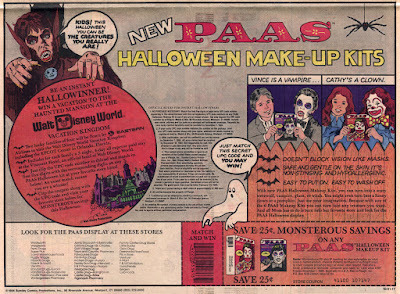 No, because PAAS Halloween Make Up kits were magical.